Wu Chao was one of T’ai Tsung‘s girlfriends. After he died, she became his son’s girlfriend too! The son’s name was Gaozong. Once she got Gaozong to really love her, Wu Chao used Gaozong’s love for her to get rid of all his other girlfriends. She ordered people to kill some of them! Eventually Gaozong married Wu Chao, so she became the empress. As empress, Wu Chao (woo-CHOW) was very active in politics. 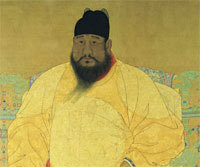 When Gaozong had a stroke in 660 AD and was too sick to rule, Wu Chao took over the government of China. In 684 AD, Gaozong died, and Wu Chao became the regent for her young son. 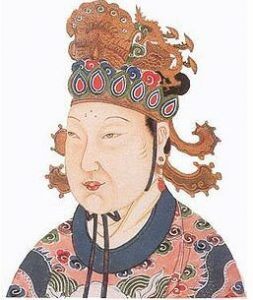 In 690, when she was 64 years old, Wu Chao forced her son out altogether and made herself Empress of China, ruling on her own. What did Empress Wu do with her power? Wu Chao was a devout Buddhist, but also promoted Taoism. She was a great ruler, and China was very successful both militarily and economically under her rule. But in 705 AD, Wu Chao (now 79 years old!) was forced out of power. Nobody could agree about who would come after her, and so there was a long civil war, with both men and women trying to get power. In 712 AD, Wu Chao’s grandson Hsuan Tsung became the ninth T’ang emperor of China. Hsuan Tsung was a great emperor who ruled a long time, and he managed to greatly expand the borders of China. So by 750 Hsuan Tsung ruled all the way to Tibet and the Sogdians in the west, and north to the Uighurs and Jurchen, and south to Vietnam. He even controlled Korea as the Sui emperors had wanted. It was a huge empire, and very powerful and rich. Where did the Sogdians live? In 751 AD, the Chinese army fought the Arabs in a great battle at Talas (Samarkand) in Uzbekistan. They lost the battle, but they succeeded in stopping the Arabs from invading China. Who was on the other side of that battle? But in the last years of his life, Hsuan Tsung turned to art and philosophy, and lost interest in running his empire. Some people say that he was more interested in his girlfriend, Yang Kuei-fei. In the end, Hsuan Tsung’s generals took over ruling in his place. One of these generals, a Sogdian named An Lu-shan, controlled the troops of north-west China. In 755 AD, An Lu-shan led a rebellion against Hsuan Tsung. Hsuan Tsung ran away to Szechwan with a small part of his army. Soon his army rebelled too. The army killed Yang Kuei-fei and made Hsuan Tsung abdicate (quit) and let his son (Wu Chao’s great-grandson) be emperor. Eyewitness: Ancient China, by Arthur Cotterell, Alan Hills, and Geoff Brightling (2000). Easy reading. China (History of Nations), by Greenhaven Press (2002). For teens. Cite this page: Carr, K.E. Empress Wu – T’ang Dynasty China – History. Quatr.us Study Guides, June 6, 2017. Web. April 21, 2019.